In 1948, just prior to the foundation of Israel, six Polish Christians were executed without trial in Tel Aviv and Jerusalem by the fledgling country’s Jewish army, the Haganah. An investigative analysis on the killings – dubbed the Riftin Report – was compiled for future Prime Minister David Ben-Gurion, but has never been made public until now. Official refusal to disclose the document comes despite fervid recommendations by chief Israeli state archivist Dr. Yaacov Lozowick, and the campaigning of the investigative Akevot Institute. According to Israeli official secrecy laws, the report should’ve been made accessible to the public in 1998 — however, state archivists argued it should remain classified. Dr. Lozowick sought to reverse this decision in 2014, but his recommendation was opposed by Ilana Alon, Director of the Israeli Defense Force and Defense Establishment Archives. Lozowick’s case for declassification is available via various web resources. In it, he made clear there was “no justification” for refusing to publish the report after so many years had elapsed, and doing so demonstrated “the state has something to hide”. “If after the passage of more than half a century the state is still concealing certain files from the public, it’s only because they contain particularly dark secrets — that is what the reasonable individual understands. A democratic society is obliged to allow a free discussion of its wars. The discussion is a guarantee of democratic resilience. This file perhaps contains material for such a discussion, but that is a reason to open it, not close it,” he explained.The state archivist’s impassioned plea was nonetheless ignored, and the government committee overseeing the release of classified files blocked its publication for a further five years on unarticulated grounds — however, ministers did not restrict citizens from viewing the report ‘in-the-flesh’ at the Israeli archives. As a result, Akevot Institute researchers located and digitized a copy of the Riftin Report stored at the Yad Tabenkin Archives and prepared to publish it on their website, submitting its version to the Israeli Military Censor for review in November 2017. Several months later, they received a response. “After Akevot issued a letter demanding the Censor give its decision within seven days, Akevot was provided with a copy of the report with each of the pages circled and stamped with the word “on hold”, in other words, barred from publication pending the final decision of the Military Censorship [committee]. Despite several reminders, for the past eight months, the [committee] has yet to provide a decision whether to allow the publication of this March 1948 document,” the group writes. For the organization, the Riftin Report saga is a palpable microcosm of the wider issue of Israeli government determination to suppress archival material implicating the state in atrocities carried out against civilians when the country was in its infancy. For instance, the Military Court of Appeals is currently reviewing a historian’s request to declassify files relating to the 1956 Kafr Qasim massacre — an application steadfastly opposed by the Ministry of Foreign Affairs, Israeli Military Censor, and IDF Information Security Department. Authorities likewise repeatedly blocked attempts to declassify files related to the 1948 Deir Yassin massacre, although ultimately settled for publishing heavily redacted versions due to public pressure. ​”While many of [these] incidents are discussed in the press and in historical literature, the state goes to great lengths to withhold publication of archival records documenting the incidents and the state’s responses to them, citing the need to protect national security and foreign relations. The result is the distortion of history and denial of both a record of our near past and the ability to have a fact-based discussion about war crimes committed by IDF soldiers and members of the security forces over the years, including before statehood, and how to reckon with them,” Akevot argues. Further complicating the picture is the recent publication of an extensive summary of the Riftin Report by leading Israeli media outlet Haaretz — their analysis refers to the document as “difficult reading”, despite the passage of decades. The report apparently doesn’t resolve key questions of who the slain Polish Christians were, why they were in Tel Aviv immediately prior to Israel’s creation, and why they were killed in quick succession. However, it documents their fates with some detail. 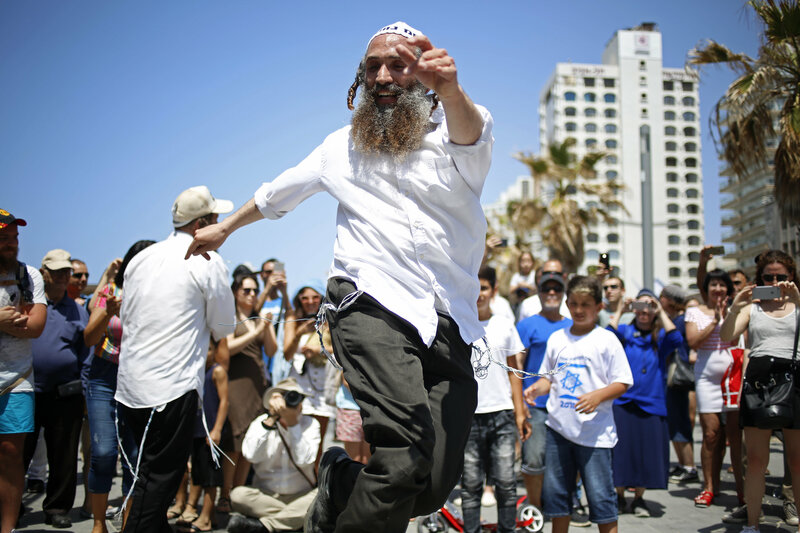 “Three weeks ago, a Polish Christian was arrested in Tel Aviv and taken to Yona base. He was not interrogated. His guard shot and killed him. 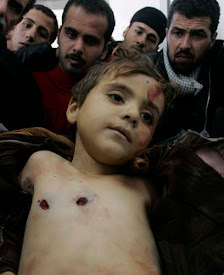 The body was taken and thrown into Hadassah Garden,” Haaretz quotes. 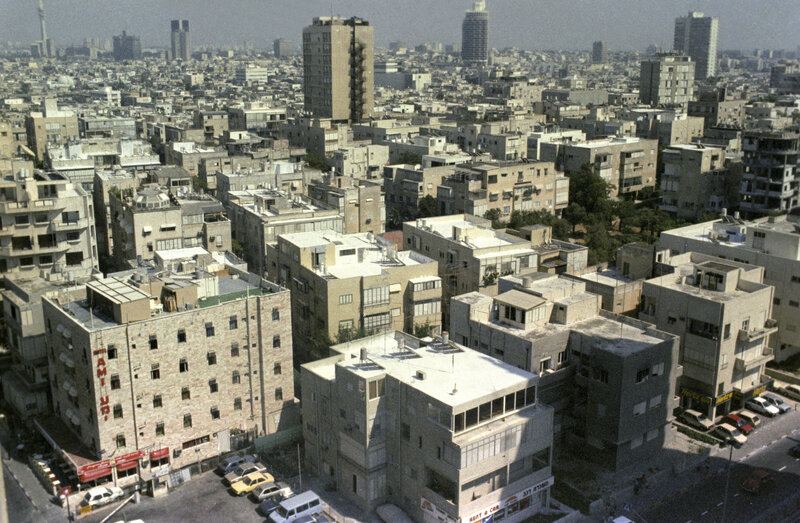 A later case involved another Polish Christian again arrested in Tel Aviv, on what is now Ben-Gurion Boulevard. His interrogation, in which he was avowedly subjected to torture, apparently exposed him as an underworld figure involved in robberies from an early age — it was also established he had “ties the Germans abroad”. The account ends curtly, stating “there was a suspicion that he was not sane. Executed.”Two more Poles were killed after being arrested near Jerusalem’s Central Bus Station because they “could not explain the purpose of their presence there”. Accounts of the pair’s final hours quoted in the report differ — one claims interrogation didn’t lead to charges against either, but “they were executed” in any event. Another states “suspicion arose they were spying on preparations for convoys leaving for Tel Aviv”, while another suggests “a letter recommending [the possessor] as a German Nazi” was found among the effects of one of them. Another Pole arrested in Jerusalem is described as an “instructor of gangs” and “well-known thief”, who according to rumor worked for local British criminal investigation department. His execution did not relate to those allegations — instead, the report states he was executed due to fears he’d be able to identify to others the location of where he was interrogated. The Riftin Report’s eponymous author, Ya’akov Riftin, was a member of the Yishuv ‘Security Committee’, which approved security-policy decisions prior to Israel’s official establishment in May 1948. He was appointed by Ben-Gurion to investigate not merely the extrajudicial killings of the Polish sextet, but a veritable catalog of crimes allegedly committed by the Haganah, and the Palmach, the military organization’s elite strike force. “Serious complaints have reached me about disorder and lawlessness among several members of the organization…robbery of Arabs, murder of Poles and Arabs without cause or with insufficient cause, and in any case without trial, improper actions toward Jews as well, cases of theft, embezzlement of funds, torture of Arabs during interrogation and the like,” Ben-Gurion wrote in his appointment letter. 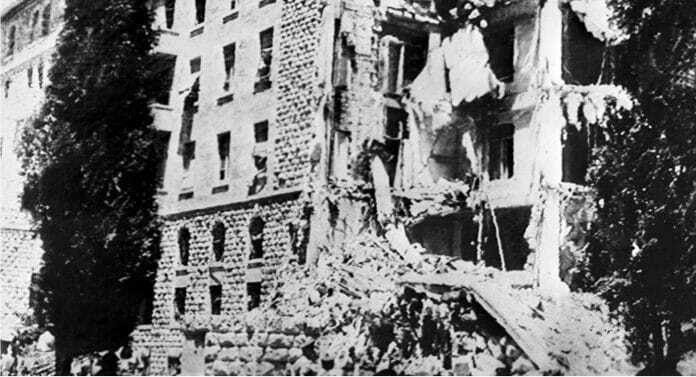 A picture taken 22 July 1946 shows the King David Hotel in Jerusalem, which housed the British Headquarters, damaged after a bombing attack against the British government by members of Irgun, a Zionist terrorist group headed by Menachem Begin. Other incidents scrutizined by Riftin include the execution of a number of Arabs, including a taxi driver kidnapped by a Palmach unit along with his vehicle. He was “put to death”, and the car later used by the mistaravim — a top secret undercover unit who disguised themselves as Palestinians to carry out various controversial operations. Again, accounts of the driver’s fate differ — one suggests there was no initial intention to kill him, merely to steal the car and leave him by the side of the road. However, when the individual began boasting of his active role in local “gangs”, Palmach operatives attempted to kidnap him in order to interrogate him further, but were “forced to liquidate” when he “resisted forcefully”. Another version of the story states instead attempts to subdue the driver with morphine before taking the car failed, so he was bundled into the vehicle’s trunk — but he started pounding loudly from his makeshift cell, meaning agents were “forced” to shoot him thrice. Whatever the reality, the nameless taxi driver seems positively fortunate when compared to another anonymous Arab slain by Haganah agents at Kibbutz Nir Am in the Negev, a semidesert region of southern Israel. He was subjected to interrogation by “unauthorized persons” and “cruel torture” — “his genital organ was clasped with pliers…his head was smashed against a wall…the Arab lay in a pit, was shot and covered over”.